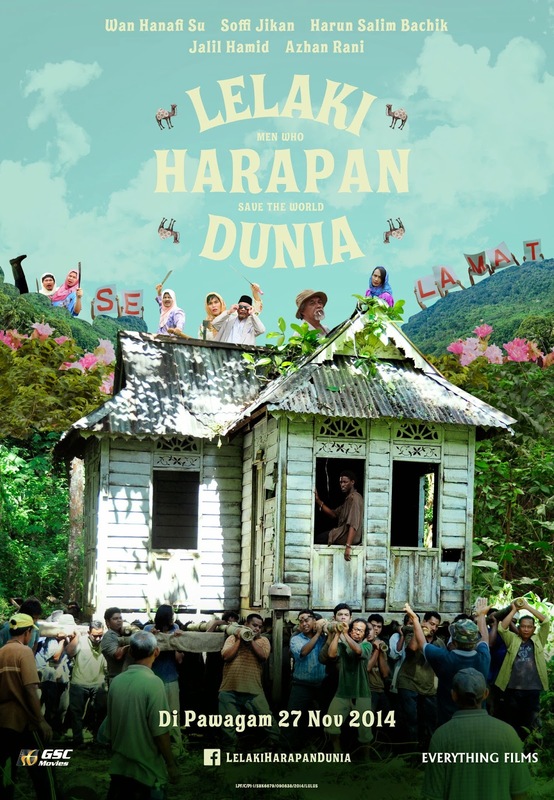 Directed and written by award-winning director Liew Seng Tat (Flower in the Pocket), the story of Men Who Save the World (Lelaki Harapan Dunia being the original Malay title) sets in a rural “kampung” (village) where its villagers are coming together to help Pak Awang (Wan Hanafi Su) carry an abandoned house (which the characters named the “American House” or the “White House”) from the jungles all the way back to the village as a wedding gift for his daughter. Despite rumours about the house being haunted, the villagers are willing to spend days of heavy lifting to make it happen to their fellow villager. 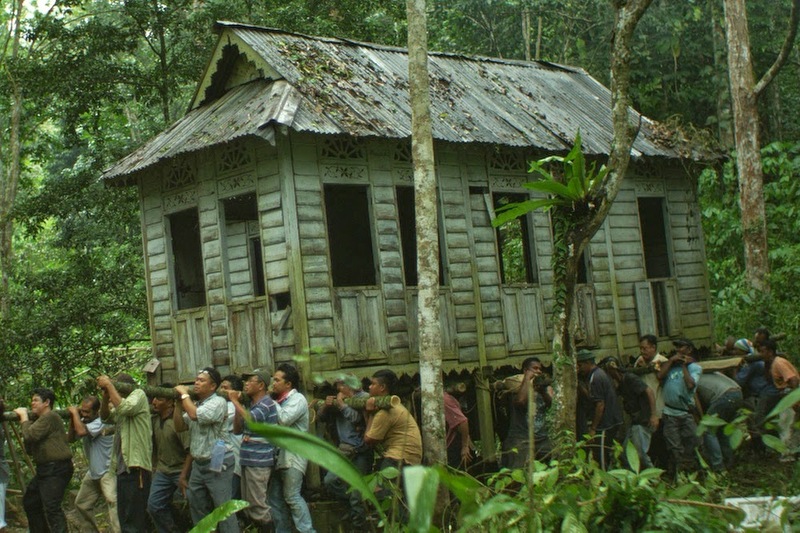 However, after only one day of the house migration process, things begin to go chaotic when Solomon (Khalid Mboyelwa Hussein), an African illegal immigrant who seeks refuge in that house, is mistaken as an “Orang Minyak” (Oily-Man, a mythical ghost that rapes virgin girls) by Wan (Soffi Jikan), a local junkie. With a series of coincidental incidents that happen around the same time, the villagers believe that the house is truly haunted and decide to go to the extremes to hunt down the Oily-Man before it gets to their daughters. Pak Awang is frustrated that the house migration has been put on hold and finds the whole situation ridiculous. Just as Liew wishes to convey, the thing that unites the villagers gradually becomes the thing that divides them as the story progresses. Men Who Save the World was in a number of prestigious international film festivals before finally opening back at its home country in Malaysia. Some of the early reviews by the western critics have voiced their concerns over the film’s cultural, racial and gender insensitivity due to its racially questionable scenes and homophobic gags while having the female characters completely sidelined. 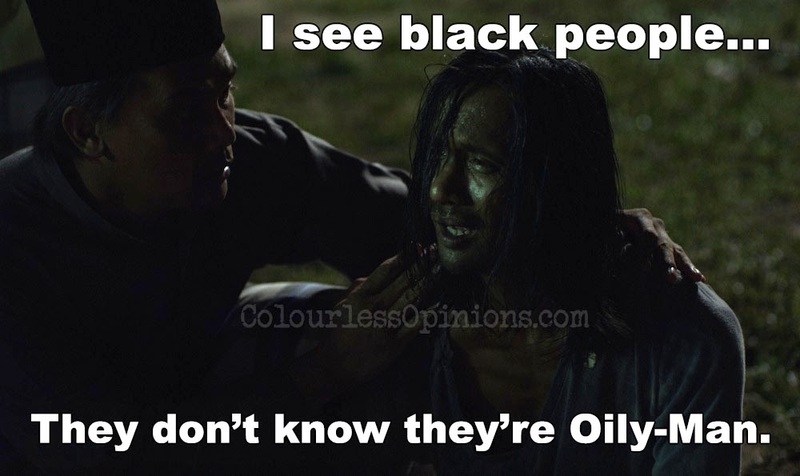 Well, it does seem that Solomon is only in the story to be mistaken as an Oily-Man ghost just because he’s dark-skinned, and he also gets stereotyped along the way. The village men, on the other hand, are portrayed as a bunch of loving fathers and sons that are overly superstitious and easily influenced due to their traditional beliefs and seemingly lack of education. There are indeed not even a female supporting character here, but then again, the title does suggest that the focus are on the Men, and perhaps the people in such rural villages actually do tend to sideline women from making decisions or serious work. The jokes such as the welcome sign (Selamat Datang) that’s wrongfully spelled as ‘happy stick’ (Selamat Batang), and villagers cross-dressing to lure the Orang Minyak away from their daughters while cursing that the apparent ghost might be homosexual, do come across as homophobic gags but frankly, I felt that the humour, even when it’s a little too exaggerated, is quite harmless as the characters are portrayed as a bunch of fools anyway. If the audience don’t find any of the mentioned issues distracting, they would likely have a cracking laugh at most parts of the film. Hollywood release movies with sexist, racist and homophobic jokes every single year but the general audience, including Malaysians, do not seem to have a problem with it anyway, and not to mention about their contribution to the films’ high position on the box office. It may not be politically correct, but it’s not that big of a deal to the general audience. What the western critics might have failed to understand was that parts of the film may be a deliberate form of satire which, perhaps, only Malaysians could relate to — visits by politicians to garner and maintain support, people resorting to violence and going against each other without clearly understanding the real problem, the horror of ritual slaughtering, corruption, “gangsters”… I’d rather not say more but locals would get the idea. Liew is bold enough to sneak these little satires in, but any more than that would’ve gotten the film completely banned from being released here in Malaysia. Veteran local actor Wan Hanafi Su’s committed performance as the constantly grumpy Pak Awang is so convincing that I could actually feel the frustration and desperation of the character. Soffi Jikan’s performance as Wan, the lonesome drug addict, stands out as one of the funniest character in the entire film but definitely underdeveloped and is practically left out in the last act. Same goes to the most of the rest of the cast who acted well but had the limited screen time to explore their roles. It also seems as though the characters do not need to work for a living. Thankfully, the film does not have a plot structure that’s too generic, but I was very surprised by how abrupt the ending was. It’s quite unfortunate as I was looking forward to a heartwarming or morally thought-provoking closure. The film certainly does well conveying how easily people could be divided by the very same thing that united them in the first place, but even if Liew felt that his point has been reached at the end, the film would’ve been more meaningful if it leaves the audience with an answer or at least a hint of solution to the problem that the characters face. The cinematography by Teoh Gay Hian is absolutely stunning. It takes a lot of skills to film a set in a “kampung” area and the jungle (not to mention about the house-carrying scenes), and still make the scenery look so gorgeous. It’s one of the best camera work done for a Malay comedy that I’ve seen. The brilliant visuals are completed with the suiting music composition by the Croatian film scorer, Luka Kuncevic (War of the Worlds: Goliath 3D), that hits the right note for every scene. With all that being said, first-time producer Sharon Gan of Everything Films has truly done a remarkable job of making this film happen by bringing these talented filmmakers together while gaining funds and support from organisations all around the world. Men Who Save the World may not be a perfect film, but it’s definitely one of the stepping stones for greater things in the Malaysian film industry. Censorship in Malaysia: No noticeable skips but there’s one minor incident in the film that’s curiously not explained. Not sure if the edit screened at the local gala premiere was the same one shown at the international film festivals but IMDb and the western reviews state that the film’s running time is 94 min while the official production notes provided locally says 93 mins. Second opinion: My girlfriend felt that the film’s funny but somewhat slow. Verdict: In nutshell, Men Who Save the World is a visually beautifully, lighthearted Malay comedy that could definitely amuse the locals, but needless to say, it might not be as appreciated elsewhere.